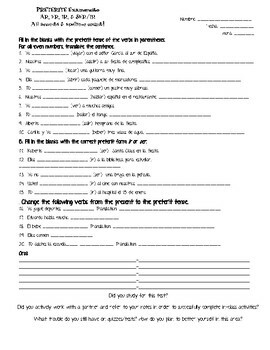 This summative assessment measures the students' comprehension of the preterit tense. With the preterit tense, comes a lot of irregulars so it is vital to assess their understanding in chunks. This exam also has an oral section for the students. I made up 5 sentences using the preterit and the students had to write what they heard and translate. This helped me see if they understood the equivalence of preterit in the TL and their NL.